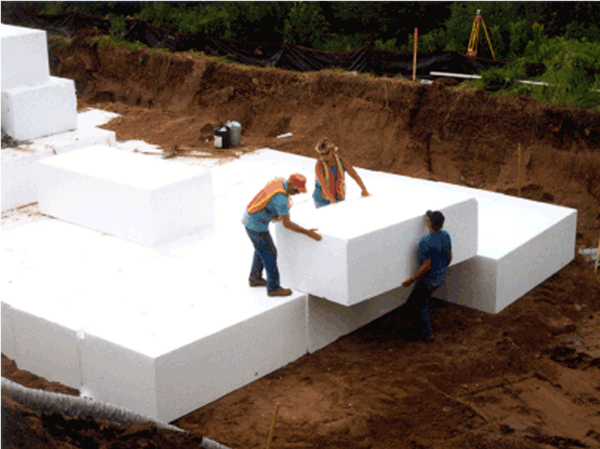 Expanded polystyrene (EPS) geofoam has been used as a geotechnical material since the 1960s. EPS geofoam is approximately 1% the weight of soil and less than 10% the weight of other lightweight fill alternatives. As a lightweight fill, EPS geofoam reduces the loads imposed on adjacent and underlying soils and structures. EPS geofoam is not a general soil fill replacement material, but is intended to solve engineering challenges. The use of EPS typically translates into benefits to construction schedules and lowers the overall cost of construction because it is easy to handle during construction, often without the need for special equipment, and is unaffected by occurring weather conditions. In addition, EPS geofoam can be easily cut and shaped on a project site, which further reduces jobsite challenges. EPS geofoam is available in numerous material types that can be chosen by the designer for a specific application. Its service life is comparable to other construction materials and it will retain its physical properties under engineered conditions of use. EPS geofoam is produced in blocks that can be cut into various shapes and sizes – and a range of compressive resistances – to suit specific project needs. As an engineered product, it can be produced to obtain the required compressive resistance. EPS geofoam density, is only about 1% of that of soil and rock, is controlled during the manufacturing process, making it a superior, ultra-lightweight fill material that significantly reduces the stress on underlying subgrades. The lighter load can reduce settlements and can improve stability against bearing and slope failures.